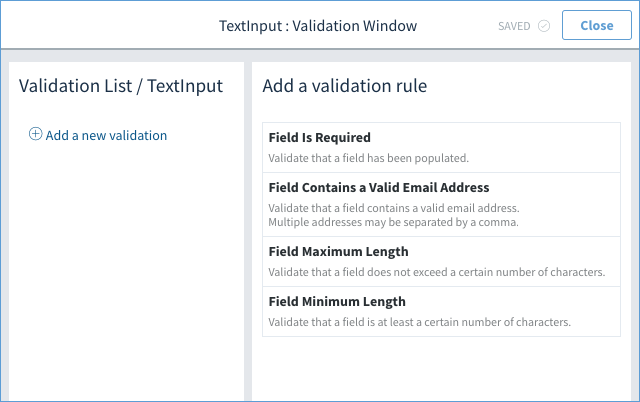 What is field validation and how does Method impelement it? A control that takes user input can have validation rules added to them. 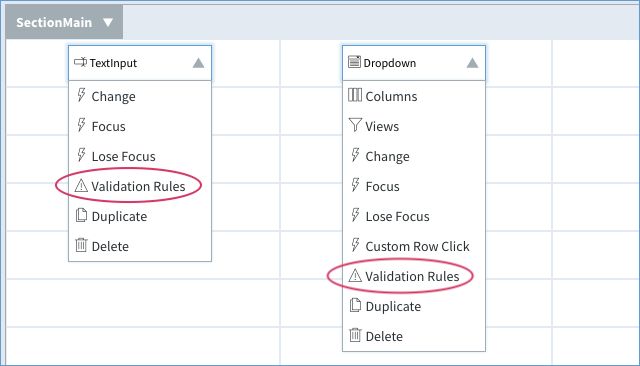 What is a validation rule? It is a requirement the user must follow in order for the control to accept the input. Doing so will open up the control's Validation Window. The below image is an example of the TextInput's validation controls. To add a rule to the control, you select it from the validation rule list on the right. Some rules require further configuration (e.g. the Minimum Field Length needs to know how many characters is required as minimum). Field is required - Validate that a field has been populated. Field has a maximum length - Validate that a field contains a valid email address. Multiple addresses may be spearated by a comma. Field has a minimum length - Validate that a field does not exceed a certain number of characters. Field contains a valid email address - Validate that a field is at least a certain number of characters. If a validation rule is added to a control, the action Validate Controls on Screen can be used to check if the object obeys these rules. The Save All action can also be configured to check validation rules before saving.